Most of the images I deliver are in color, however, occasionally I deliver black and white images. When do I decide that black and white version would be better for a particular image? Typically, I like to turn the image black and white when I want to turn the viewer's attention to the subject directly and away from distractions. Sometimes, for artistic purposes, I like when the photo is black and white. 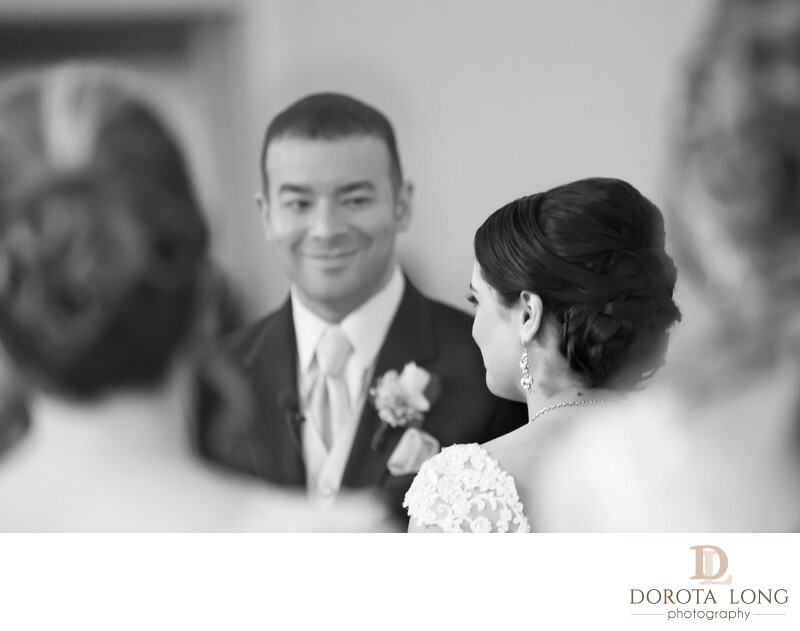 In this image, I really loved how the groom was looking at the bride with such love and passion but I wanted to eliminate the distractions - the bride maids. I thought the image would look better if if it was black and white. My subject was actually the bride and the left side of her face. The groom is intentionally out of focus. I love shooting with long lens with wide aperture so that I can really get a good focus on the subject and good separation from the background. I shot this image at a 2.8 aperture so everything but the bride's ear and hair is out of focus. I loved how the groom was looking at the bride. This image perfectly captures his love towards his future wife.